Project Update: Beginning on Sept. 24, 2018, crews will begin the process of taking down the structures at 2211 and 2215 N. Culpeper St. in preparation for the replacement construction of Fire Station No. 8. In September 2015, and after a rigorous public process to identify new sites for Fire Station No. 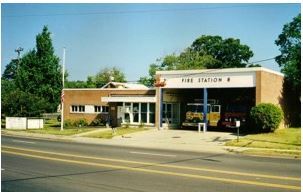 8., the County Board appointed the Fire Station No. 8 Task Force and charged the group with reviewing these siting options for a replacement station. The Task Force held several meetings and ultimately recommended building a new four-bay station in the location of the existing station at 4845 Lee Highway. In July 2016 the County Board accepted the Task Force recommendation and voted to build a new Fire Station No. 8 at its current location. In January 2107, the County Board approved the acquisition of three parcels to use as a temporary location for Fire Station No. 8, while the new one is being built. The parcels, located at 2211, 2215 and 2217 N. Culpeper Street, are immediately adjacent to the existing station – this keeps the station in the same general area and affords minimal disruption in fire operations. Combining the acquired parcels with the existing fire station site will offer efficiency and cost savings in construction of both the temporary and new permanent station. The temporary location is expected to include temporary engine bay structures on the 2211 and 2215 parcels and the living quarters will be located in the existing 2217 N. Culpeper Street building. Funding identified in the 2017-2026 CIP and provided through other various funding sources.